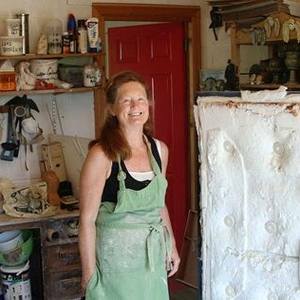 I am a ceramic artist working from my private studio and gallery in beautiful Ringabella, Cork, Ireland. My work covers a wide spectrum from the human figurative to forms of the natural world, from sculptural pieces to wall framed ceramic scenes. All represent my inate love of loose form and colour, helping to capture the dynamics of natural life. Educated at Cork Crawford School of Art and Design. Graduated after four year full time diploma course specialising in ceramics. This was immediately followed by one year post graduate course specialising in ceramic glazes. Have worked as a full time artist for over twenty years. See web site for full CV and exhibition listings.